This is my new shirt from Talbots that I picked up during the 30% off sale- it did not photograph well, but its gorgeous!! Fits like a dream. There is only size 16P left, but if you can fit that size, grab it! Oh, this jacket is also down to $30, if you still have some in your store! Online only XXS left. Cute shoes!! That bow or flower or little cute thing is adorable!! I love love looooove that shirt! And I gave you a blogger award. Check out my blog for the award! What a fab shirt and cute shoes! Enjoy your day! Sounds like you've been finding some amazing deals! 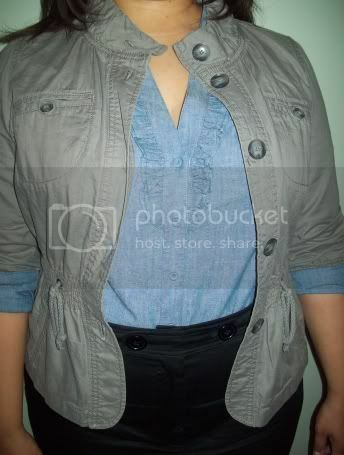 I really like this look - way to dress up the utilitarian style this spring for work! Bianca....I love your outfit and that jacket is a must have! I LOVE the shirt and how the sleeves come out below the sleeves of the jacket. I love when people carry the color through an outfit like that, it just gives it such a subtle but crisp pop. And the detail on the shirt is beautiful! Marianna - thanks so much! TI - thanks so much! I will check it out! Cynthia - thank you, I hope yours is great too! Diana - yess. I love me some deals. Cheeky Curves - thanks so much for stopping by! Amanda - thanks - love this look right now! Love, love this outfit. It looks effortless,pulled together and chic...my favorite way to dress.